And when you have large pores, the only way to recreate refined skin is to mash it down until it disappears. (Makeup artist tip—that’s really how you do it on large pores, by pushing it down with a rolling motion.) It sits on the skin for the rest of the day and if you get the right primer, it’s going to glide on makeup to perfection and not clog any pores. Sometimes primers can even be a hybrid of skincare and makeup, with an array of ingredients that can benefit our skin and address other issues. There is a laundry list of primers out there, but we’ve curated only the best based on our experience and other consumer reviews. 1.5 5. Dermablend Insta-Grip Jelly Face Primer, 1 Fl. Oz. These are our choices for the best non-comedogenic primers for acne-prone skin based on our experience, formulation, claims, value for money, and consumer reviews. Make sure to choose the primer that’s best suited for your skin type and skin issues. Makeup and skincare in one, this mattifying primer is specially formulated for calming, covering, and preventing adult acne. Green mineral pigments help neutralize any redness**, while chamomile & arnica help calm and nourish the skin. Phytosphingosine fortifies the skin’s defenses against bacteria. All this while providing an effective canvas for even makeup application. Dermatologist tested. Non-drying, Non-comedogenic, Non-acnegenic. Formulated for all skin types, including oily and acne prone skin. Free of parabens, sulfates, fragrance, talc, and gluten. Apply a pearl-sized amount on your index and middle finger. Press and roll the primer in areas where there are bumps, flakes, large pores, and redness. Repeat until the texture looks even. 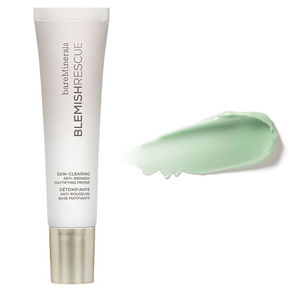 This is another specialist primer that doubles as a primer and blemish minimizer. It’s an oil-free formula that smooths the skin to an even surface for the perfect makeup application. It also helps product glide on easily and last longer. This means you’re color-true for hours and look fresh throughout the day. If you’re on the oily side, this also helps control shine and minimize the appearance of pores. The consistency is a lightweight, soothing, and water-based gel. Unlike traditional primers, this isn’t overloaded with silicones so it won’t feel like there’s another layer on. On the downside, this also means there won’t be much assistance if you have visible acne scarring or very large pores (you’ll need a silicone-heavy primer for that). All in all, a well-rounded primer for acne-prone skin that knocks it out of the park. 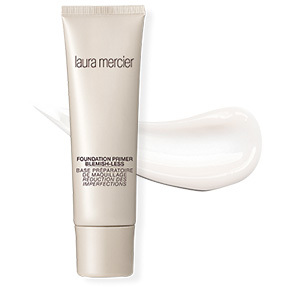 BONUS: If you’re not too keen on salicylic acid, there’s a version of the same primer that replaces it with antioxidants and a vitamin complex—the Laura Mercier Foundation Primer: Oil-Free. *Based on a 4-week clinical efficacy study conducted on 30 subjects. Apply after moisturizer or sunscreen, gently massage primer into the skin with your fingertips. This is the brand’s most nourishing primer, which aims to prep dry or dehydrated skin with a moisture and vitamin-rich formula. It helps deliver a natural, dewy base for your makeup application. The lightweight and creamy consistency give a soft-focus effect to help minimize the look of pores, fine lines, and other imperfections. Based on the same non-comedogenic formula, this hydrating primer soothes and conditions the skin. It also creates a moisture buffer enhanced with a cocktail of antioxidants to protect the skin against the harmful, aging effects of the environment. BONUS: Alternative for extra luminous skin, try Foundation Primer: Radiance or Radiance Bronze. 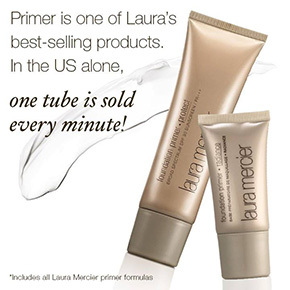 Beauty FYI: Laura Mercier created the industry’s first primer in 1995. She originally studied art in France and wanted to create a product that would blend makeup perfectly to the skin, like paint on canvas. Gives a soft-focus effect to help minimize the look of pores, fine lines, and other imperfections. Apply after moisturizer or sunscreen, gently massage primer into the skin with your fingertips. If you have severely dry skin, add a hydrating serum in between. This is also the perfect primer for winter. A product that you’ll find in most professional make-up artist’s arsenal–and with very good reason. This pore-minimizing primer features a triple-blurring complex with light diffusing technology that immediately blurs pores and fine lines to create an immaculate canvas for the rest of your makeup. From experience, this one makes you Insta-ready in a flash. The formulation also contains longwear polymers which are a balance of emollients to keep your skin moisturized and give you a radiant glow. Its unique time-released skin balancing technology helps control shine while locking in moisture throughout the day. This primer is silky, lightweight, oil-free and non-comedogenic; all essential in keeping any potential breakouts at bay. All the above combined can give you an even-toned, retouched appearance in an instant. Triple-Blurring Complex – light-diffusing, soft focus ingredients to instantly perfect your skin’s texture and minimize the appearance of pores, wrinkles, and fine lines. Cons: For those with oily skin, you’ll need to blot after around two hours. From experience, it’s not as oil-controlling as the other primers on this list. Apply a thin layer throughout your face and under the jaw. The blurring effect should be instantaneous. 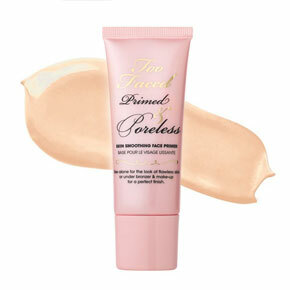 Allow primer to set for at least 10 seconds before applying your foundation. 5. 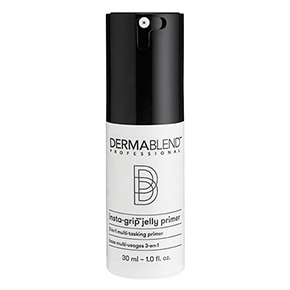 Dermablend Insta-Grip Jelly Face Primer, 1 Fl. Oz. This is a powerful 3-in-1 multi-tasking primer that gives 24-hour extended makeup wear, is an instant facial moisturizer, and delivers a subtle skin-tightening effect. All this makes for a better makeup application and longer wear. It’s also quick absorbing, formulated with plant extracts and glycerin to moisturize, smoothen, and tighten skin for enhanced makeup application. The silicone-free, non comedogenic, jelly texture dries to a natural finish and creates a fresh canvas. Formulated without: parabens, phthalates, triclosan, sodium lauryl sulfate. Developed for safety:dermatologist-tested, fragrance-free, allergy-tested, sensitive skin-tested, non-comedogenic, non-acnegenic. Vegan formula: no animal derived ingredients or byproducts. Apply 1 to 2 pumps on your fingers and apply to your face in outward and upward strokes. Let it absorb for at least 30 seconds before applying your foundation. Use a damp beauty blender to apply foundation for a smoothing effect. Developed for safety: dermatologist-tested, fragrance-free, allergy-tested, sensitive skin-tested, non-comedogenic, non-acnegenic. This award-winning primer has a wrinkle-smoothing formula that leaves a soft veil over the skin’s surface—concealing fine lines, pores, wrinkles, and other imperfections. It has an ultra-light texture that melts into your skin but neither weighs down nor clog your pores. Your skin becomes even and flawless, ready for your foundation. Non-comedogenic; allergy and ophthalmologist tested. Always use the scooper it comes with when getting the product from the container. It’s more hygienic and the primer won’t get under your nails (yikes). Wait a few minutes before applying your foundation. The heat from your skin will help the primer melt into fine lines and pores. Additional Benefits: Non-comedogenic; allergy and ophthalmologist tested. Quite pricey for the amount of product, though a dime size is all you need for the entire face. If you put it on too thickly, it can clump up with powder foundation. 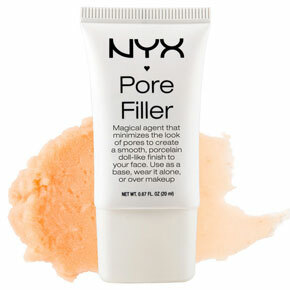 This pore filling primer and can work for both dry and oily zones, so it’s perfect for combination skin. The texture is thick and comes in a neutral shade, which disappears on the skin once applied. It also helps your foundation stay throughout the day as it’s specifically formulated to be worn under makeup. It also has several vitamins (A & C), mulberry extract, and a dose of retinol. This gradually helps banish pores while leaving the skin firmer, hydrated, and detoxified. Make sure to pair with a good non-comedogenic sunscreen though, as retinol can be photosensitizing. As mentioned, only apply a thin layer to avoid patchy foundation and make your makeup last throughout the day. Careful to overdo the application as it has a tendency to pill. There’s only one shade (light beige). Whilst it disappears into the skin one blended, it can look ashen on deeper skin tones. It has a small dose of ivy extract, which can be irritating to sensitive skin. Also has a dose of retinol which can be photosensitizing. Make sure to use a good non-comedogenic sunscreen to avoid any redness or sensitivities. There’s really no mechanism for oil control, so if that’s something you’re looking for in particular for a primer, some of the earlier ones mentioned might be more suited to your needs. 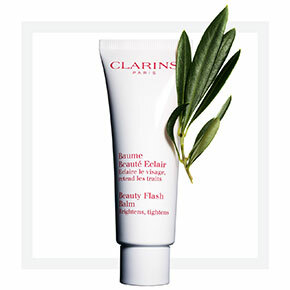 A classic and one of Clarin’s most popular radiance booster, this product is sold once every 20 minutes worldwide. This brightening balm eliminates signs of fatigue and is the ultimate refresher for tired, stressed skin. It instantly moisturizes, brightens, and tightens the skin so your face looks rested and relaxed. This non-oily formula makes for a great primer for hours of luminous makeup wear. After cleansing, apply a thin layer and do not rub. Glide in an upwards motion for a tightening effect. We find that the glow effect diminishes after a few hours. This hydrating primer is formulated specifically for dry skin. It has powerful skin plumping ingredients like hyaluronic acid, glycerin, and coconut alkanes that gives instant and lasting hydration. Perfect for winter use. It also improves application and wear time of your foundation. It smooths over flaky skin, fine lines, and pores; as well as prevents any makeup from setting into the creases. Its rich, silky texture dries to a smooth, glowing finish with a soft-focus effect. A blend of minerals also gives a hint of opalescent luminosity. 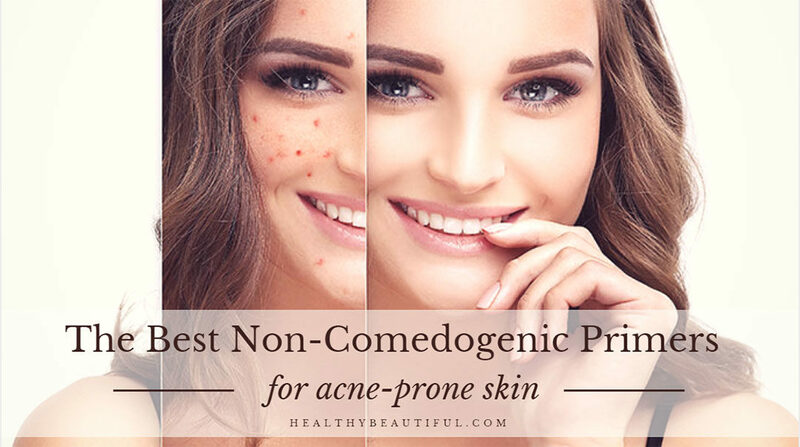 Non-comedogenic: will not clog pores or contribute to breakouts. Oil-free, sulfate-free, paraben-free, and fragrance-free. BONUS: An alternative for combination skin is the COMBO CONTROL™ MILKY FACE PRIMER. This is a lightweight version that keeps the skin’s moisture balanced while absorbing any excess oil. It has a milky feel that dries to a powdery texture for a soft, natural finish. Apply a pea sized amount after your moisturizer and before foundation. Don’t rub it in—use the heat of your fingers and pat into your skin. Wait for it to absorb before applying makeup to avoid any pilling. Cons: It’s rich and thick, you might need to work it in some instances. This pore filling primer is quite similar to the Benefit’s the Porefessional above and L’Oreal’s Magic Base in that it’s mattifying and dries to an almost powdery finish. The consistency is thick (I’d say it’s similar to royal icing) so you can use this to zero-in on your problem areas. After applying a non-comedogenic moisturizer (don’t forget to wait until it’s fully absorbed!) squeeze a pea-sized amount on your fingers and gently pat it in. It’s weightless on the skin and the initial peachy tint fades out so you can wear it underneath your concealer or foundation without it clashing with any shade. The tube is pretty small but it’s very affordable and you’ll only use it in small amounts so it should last for a long time. Keep away if you have dry skin because it has a tendency to cause makeup to look cakey. Cons: For comparison’s sake, this version is a bit tackier than the Porefessional. This can also leave you patchy if you’ve peeling or dry areas. Set for a few minutes so it won’t pill. Make sure to exfoliate and moisturize well because it can give you dry patches if you have any peeling or dry spots. It’s one thing to have the perfect primer, but it won’t be as effective if it’s not used properly. Clear out any build up of (sometimes invisible) dead skin. This will prevent uneven application and that sketchy-looking surface you get when you apply foundation on dry skin. You can use physical exfoliation during cleansing or chemical exfoliation through AHA toners or AHA serums. Moisturize well beneath your primer and wait for 5 minutes or so to let it absorb fully. If you apply your primer on a skin that has traces of moisturizer, your foundation will break up into patches pretty easily. If you have acne-prone skin, use a non-comedogenic moisturizer underneath. Something with a matte finish like La Roche-Posay’s Effaclar Mat Oil-Free Facial Moisturizer is a great choice for oily skin. It’s very important for people with large pores to always keep the oils at bay because they reflect light and tend to exaggerate the skin’s uneven texture. A face that is mattified, however, can give your skin an airbrushed finish. If you have issues with excessively oily skin, I recommend a highly acclaimed program called The Oily Skin Solution by Patricia Everson. Our skin is very dynamic and the causes of oily skin can be one or ten things at once. This guide can help you get to the root causes of your oily skin and help you get rid of it. If you have oily skin, use the right face wash to avoid early production of sebum. Primers not only makes your skin look smoother, but they also help make your foundation stick to your skin for hours on end. It’s not a hard and fast rule, but you should always try to combine products that have the same base. If you apply a water-based foundation to a silicone primer, the silicone primer will tend to repel the foundation and prevent it from thoroughly blending into your skin. This can cause unevenness and will not make your makeup last as long as it could. You should always try to combine makeup based on the same ingredients–silicone-based primers works best with silicone foundations and water-based primers with water-based foundations. Do not rub your primer. Rubbing will ball up the product instead of setting into your pores. Just press and pat gently with your fingers until you’ve filled all your pores. The heat from your fingers will lead to better application. Try not to over apply your primer. Overdoing it will cause your concealer or foundation to slide sooner than later. Just use a small drop and apply a thin layer on your skin. Remember, not every product will work for every person. You may need to try and observe which combination of products will work best for your skin. 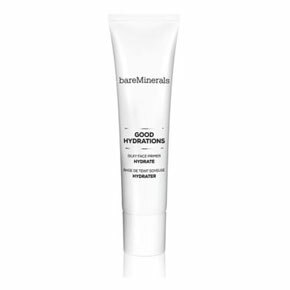 bareMinerals Mineral Makeup and Skincare for Face, Eyes and Lips. (2018). 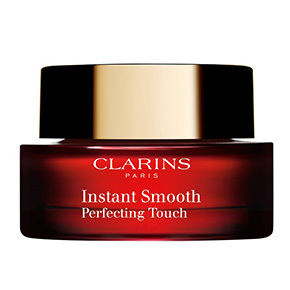 Clarins: Beauty Products, Cosmetics, Makeup, Body Care – CLARINS. (2018). Dermablend Foundations, Concealers, Setting Powders, brushes, Makeup Remover, Skincare. (2018). 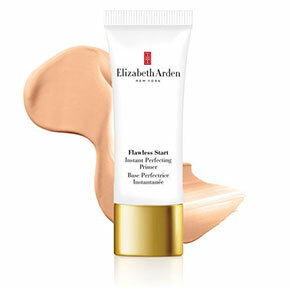 Elizabeth Arden Makeup, Skincare, Perfume & Gifts | Official Site. (2018). NYX Professional Makeup Official Site – Professional Makeup & Beauty Products. (2018). Too Faced: Makeup, Cosmetics & Beauty Products Online – Too Faced. (2018).